For the 2018 model year, the Chevrolet Traverse underwent a makeover that included tech features such as upgraded infotainment software and advanced safety systems, as well as a more spacious body design that earned it the honor of best-in-class cargo capacity. There’s also a new version added to the Traverse lineup: the Chevrolet Traverse RS trim. This trim level was made to deliver an enhanced, sporty design that matches its powerful engine. The all-new Traverse RS comes with distinct styling elements such as a black grille, window trim, roof rails, and bowtie emblems, in addition to a Dark Android finish on the 20-inch aluminum wheels. Underneath the hood of the RS model is a standard turbocharged 2.0-liter EcoTec engine that’s been rated at 257 potential horsepower and 295 lb-ft of torque, and will be matched to a new nine-speed automatic transmission. This powertrain combination was engineered to deliver a smoother and more athletic performance than other trims in the Chevrolet Traverse’s lineup. 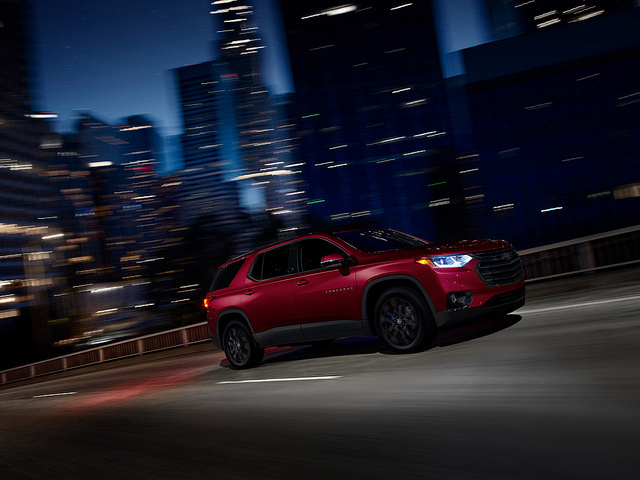 The new Chevrolet Traverse RS trim is part of the next-generation Traverse’s expanded selection of trim levels, which Chevy representatives said is part of a plan to make the nameplate appeal to a variety of lifestyles, needs, and budgets depending on what options buyers choose. With a long list of standard features, the 2018 Chevrolet Traverse RS is perfect for drivers who want a more street-inspired look. Get more information on the RS trim and the rest of the Traverse’s available configurations by contacting Hanner Chevrolet.